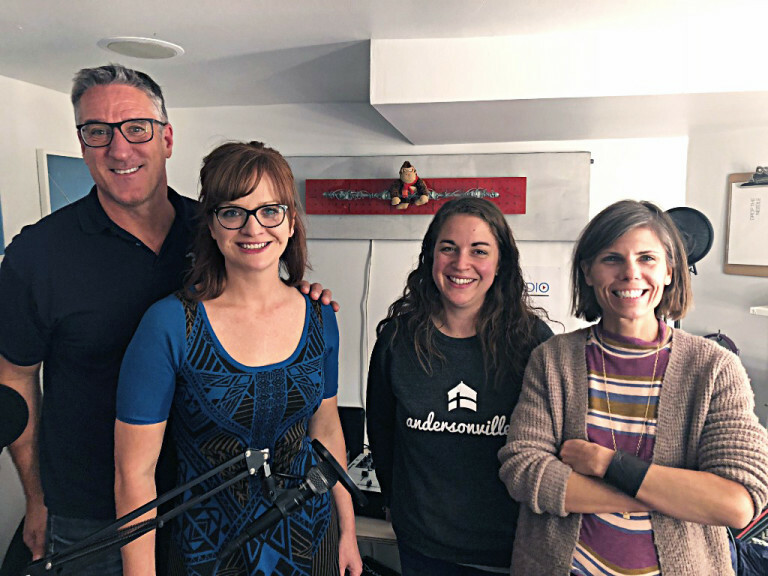 This week, Laura and Sara are joined by Steve Satek, President and Founder of Great Lakes Clinical Trials, and special guest, Great Lakes Director of Marketing, Amber Holst. Great Lakes specializes in the study of investigational medications, food products, devices and supplements for the treatment of chronic diseases, notably in Mental Health, Memory Disorders and Pain Management. Steve is one of the passionate, dedicated leaders in Alzheimer’s research and Great Lakes is determined to find a way to prevent the disease from occurring in aging older adults. With two locations in Arlington Heights and Chicago, you can find Great Lakes just around the corner at 5149 N. Ashland. (from left) Steve with Amber, Sara and Laura in Transistor’s Studio C.
Steve has been working in the field of clinical research for the last 25 years. His education is in biochemistry and molecular biology. He spent a good amount of time as bench researcher, but didn’t find it very social. What is a bench researcher? Check out this informative blog post. Steve started working clinical trials for cancer treatments while working at Northwestern University, and he worked his way up to bigger trials for larger clinics. He soon discovered he preferred a smaller clinic setting, leading him to open Great Lakes Clinical Trials in 2014 in Andersonville. Steve was recently named by Crain’s Chicago as one of the most notable LGBTQ Executives for 2018. Check out the full article here, and Steve’s feature here. Great Lakes is servicing a growing community of older LGBTQ adults. Steve has always wanted to bring a clinic to a community, as opposed to bringing a community to a clinic. The opening of Great Lakes Clinical Trials allowed Chicago’s north side population to have somewhere closer to travel to as one of only a few clinics in the Chicagoland area. Steve also mentions the close proximity to Swedish Covenant Hospital and the partnership of services provided there. What is a clinical trial and how do people enroll? First, a team of board certified physicians assess each volunteer patient to make sure the individual qualifies for the trial. All of the trials at Great Lakes are free for the patient. View current studies here. According to the Alzheimer’s Association, 5.7 million Americans are living with the disease. Steve has been doing Alzheimer’s research for nearly 20 years. There are only four medications approved by the FDA right now to treat memory loss, but none of them specifically target Alzheimers. Great Lakes is working to target the source of memory loss in the brain; not just treating the side effect of memory loss. To get the word out about Great Lakes Clinical Trials, Steve and his team do informative workshops around Chicagoland to encourage participation in trials. View upcoming events here. Steve has lived in Andersonville since 1991. He knows that active older adults in the neighborhood want to participate in research studies, and offering the convenience of a nearby clinic is invaluable. Chicago Alzheimer’s Awareness Day will be celebrated on Thursday, November 8. Thursday, November 8 has been named Chicago’s Alzheimer’s Awareness Day by Mayoral Proclamation. Patients who have participated in past research studies will speak to help educate the community on why these type of studies are so important. Special guests include both Alderman Osterman of the 48th Ward and Alderman O’Connor of the 40th Ward. Learn more about the event. RSVP for the event in advance. The event will also feature free genetic cheek swabs to determine whether or not the Alzheimer’s gene is present, as well as memory screening. Individuals can also sign up for free memory screenings at any point at Great Lakes Clinical Trials. Great Lakes is also conducting prevention trials with older adults, who may have the genetics to develop Alzheimer’s, but are not yet exhibiting systems. Prevention trials are for ages 60-70 and 70-75. If given the chance to switch places with an Andersonville business for the day, Steve would choose to switch places with our very own Sara Dinges of the Andersonville Chamber of Commerce staff! Amber would choose to switch places with AlleyCat Comics (5304 N. Clark). Purple ribbons line Clark Street in Andersonville in honor of November’s Alzheimer’s Awareness Month. On November 8th - Chicago Alzheimer's Awareness Day - Great Lakes Clinical Trials and the Global Alzheimer's Platform Foundation are hosting a major research recruitment event for people in the community who are interested in learning more about memory concerns and Alzheimer's disease. Great Lakes Clinical Trials is proud to announce that Chicago Mayor Rahm Emanuel has officially proclaimed November 8th as “Chicago Alzheimer's Awareness Day”. This proclamation is associated with a citywide event taking place at the Swedish American Museum on November 8th to help raise awareness about the disease and to honor those volunteers that have taken steps to participate in research studies to help find a treatment, cure or prevention. “I am so proud to be a lifelong resident and business owner in the City of Chicago, which recognizes the tireless achievements of medical research clinics and more importantly, the local residents who volunteer take part in clinical trials,” commented Steve Satek, President of Great Lakes Clinical Trials. “Without the participation of our senior community in research studies, we will never find a treatment or cure for Alzheimer’s disease. We are grateful for those that volunteer their time to join trials at Great Lakes Clinical Trials, as well as our many other research centers across Chicagoland”. More information on the November 8th “Chicago Alzheimer's Awareness Day” event can be found on the Great Lakes Clinical Trials “Events” page or by clicking here. NOW, THEREFORE, I, RAHM EMANUEL, MAYOR OF THE CITY OF CHICAGO, do hereby proclaim November 8, 2018 to be CHICAGO ALZHEIMER'S AWARENESS DAY in recognition of the tireless work and ongoing contributions of the research community in finding a cure for Alzheimer's disease. Dated this 25th day of September, 2018. Chicago, IL – Great Lakes Clinical Trials Founder and President, Steve Satek, is one of Crain's Chicago Business’ Chicago's Notable LGBTQ Executives 2018. Satek is being recognized for, among other things, his leadership at Great Lakes Clinical Trials which has greatly contributed to it being one of Chicago’s leading clinical research centers. Great Lakes Clinical Trials was established on the principle of making clinical study opportunities more convenient and comfortable for patients. This means providing easily accessible locations within neighborhood communities, including Andersonville and Arlington Heights, as well as creating a welcoming atmosphere to patients of all backgrounds, ages and sexual orientations. By 2030, there will be nearly five million adults aged 60 and older in the U.S. who identify as lesbian, gay, or bisexual. As advanced age is a key risk factor or Alzheimer’s, Satek has created a community-based, LGBTQ-friendly center where volunteers and care partners can comfortably participate in clinical trials. For more information about the ongoing research at Great Lakes Clinical Trials, visit: greatlakesclinicaltrials.com. The announcement was made in Crain’s August 27th print edition as well as online at ChicagoBusiness.com. This section profiles Chicago's notable LGBTQ executives, specifically those who are advancing their industries and/or workplace equality. Great Lakes Clinical Trials is an independent, community-based research clinic. With two Chicago area locations in Andersonville and in Arlington Heights, the Great Lakes team have managed more than 525 clinical trials over the past 25 years and are committed to providing quality services for both study volunteers & the research industry. Great Lakes Clinical Trials specializes in the study of investigational medications, food products, devices and supplements for the treatment of chronic diseases, notably in Mental Health, Memory Disorders, Pain Management, Nutrition and Dermatology. For more information, please visit http://www.greatlakesclinicaltrials.com/. Steve Satek, Great Lakes Clinical Trials President, is proud to have accepted an invitation to participate on the Alzheimer's Association, Greater Illinois Chapter, Medical and Scientific Advisory Committee for 2016. "I am truly honored to accept this position," commented Mr. Satek. "Our Great Lakes Clinical Trial research team has worked tirelessly to fulfill our mission of educating the people of Chicagoland about the exciting developments in Alzheimer's disease research. The Alzheimer's Association has been an amazing leader in this area and I look forward to collaborating to expand the outreach and message across our State." The services of the Alzheimer's Association, Greater Illinois Chapter, rank at the top in the nation and serve as the national model in many instances. Illinois is among the states with the highest estimated number of people with Alzheimer's disease, currently at 210,000. By the year 2025, it is projected that Illinois will have 260,000 people with Alzheimer's - up by 24 percent over current numbers. In 2016, our Chapter is committed more than ever to inform, educate, support and provide hope to all throughout Illinois who are affected by dementia.